The litany of exciting Maker Faire products continues with MaKey MaKey, a device that turns anything capable of conducting electricity into a controller. Developed by MIT Media Lab students Jay Silver and Eric Rosenbaum, you simply run a bulldog clip from the board to an object and hold a connecting wire in your hand. Connecting over USB, it's entirely programming-free, but if you find your interest piqued, you can flip the board over to use the Arduino module baked into the hardware. It's already surpassed its original $25,000 Kickstarter goal and when the run begins, you'll be able to pick up everything you need for just $35 -- but if you can't wait that long, head on down to the Bay Area this weekend. 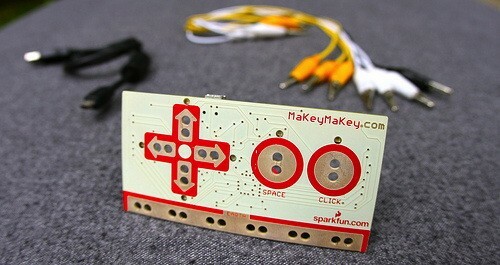 MaKey, MaKey turns the whole world into a keyboard originally appeared on Engadget on Fri, 18 May 2012 01:14:00 EST. Please see our terms for use of feeds.